Rosacea (or acne rosacea or erythematotelangiectatic rosacea) is a benign skin condition that can be aesthetically displeasing and socially embarrassing. Laser treatments have revolutionised the aesthetic management of rosacea. They remain the benchmark treatment and are safe when used by experienced professionals. However, electrocautery still has a place in the treatment of certain very localised forms. The zones usually affected are: the cheeks, the sides of the nose, the forehead and the chin. The symptoms of rosacea are redness, itchiness, sometimes stinging around the eyes and hot flushes. 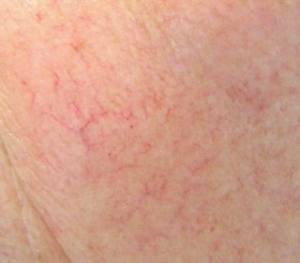 At a more advanced stage, there can be inflamed papules. At a late stage, the nose can be hypertrophic, red and uneven. This is called rhinophyma. The treatment of rosacea is based on coagulating the haemoglobin in the vessels and damaging the vessel walls in order to block them. Sessions are performed by Dr. Patrick Médard de Chardon, dermatologist, at 145 rue d&apos;Antibes in Cannes.